The Irish Times is on a mission to find the best place to holiday in Ireland and is inviting people in Laois to nominate their area or favourite destination. It can be a town or city, village or remote beauty spot. Residents and visitors, alike, can nominate their favourite places by going to irishtimes.com/bestplace and writing a short pitch for the judges to consider. Entry is free and every week, The Irish Times will publish a selection of nominations in the newspaper. The closing date for entries is 20th April, and the winning holiday spot will be announced at the end of May. 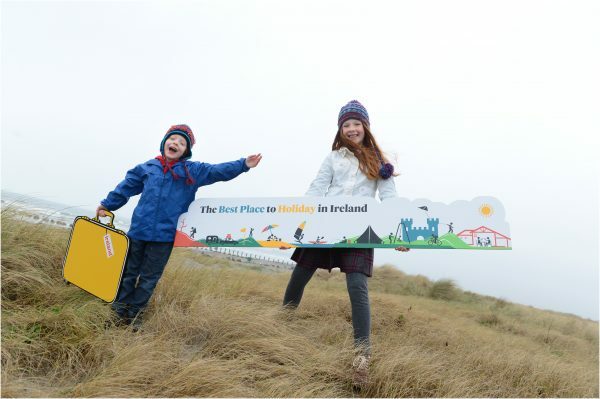 Pictured at the launch of the Irish Times Best Place to Holiday is from left to right Nicholas Goodman and Trudie Goodman. The competition will be judged by a panel of four national experts from different walks of life comprising Eamon Ryan, Leader of the Green Party, tourism entrepreneur and former Minister; Margaret Jeffares, founder of the Good Food Ireland initiative and tourism entrepreneur; Rosita Boland, Irish Times journalist and author of A Secret Map of Ireland and Steve McPhelimy, Derry-based hostel owner and tour guide with Paddywagon Tours. According to the judges, The Best Place to Holiday in Ireland can be where you go to relax and do very little, or where you go to pursue various activities. It can be rural and remote or in a busy, much-visited urban space. It could have a breathtaking view, or special features that keep bringing you back such as its heritage or culture; high-quality local produce; outdoor activities; speciality shops; or the people who live there. All of the judges have distinct and different views about what makes a great place to holiday. Commenting on what they are looking for in the nominations, judge Eamon Ryan says, “it depends on the level of welcome.” Steve McPhelimy is looking out for “things to do in a place,” and Margaret Jeffares says she is seeking “a high-quality food experience, first and foremost.” According to Rosita Boland, “a great place to holiday in Ireland is the one I want to return to again and again”. Last year The Irish Times ran a competition to find the best place to live in Ireland, and Westport was crowned the eventual winner, with Cork city, Rathmines in Dublin, Killarney, Co Kerry and Ardara, Co Donegal named as runners-up. The Irish Times ‘Best Place to Holiday in Ireland’ competition is supported by DiscoverIreland.ie.